Matthew 16:28 is often used by the preterists in an attempt to show that the Second Coming was the destruction of Jerusalem. They do that by reading Mt 16:28 where it says, “There be some standing here, which shall not taste of death, till they see the Son of man coming in his kingdom.” They claim that “coming in His kingdom” is the Second Coming, and it would happen in the lifetime of His auditioners. They point out that it is not even possible that this verse is talking about the apostle John (one of those standing there as Jesus spoke) remaining until the end of the world (Jn 21:23), because “some” is plural. They claim that Matthew 16:28 has to be Christ coming in wrath at the destruction of Jerusalem and therefore, the Second Coming has already happened. If the Second Coming has already happened, then the resurrection, the inheritance, the Judgment, the new heavens and new earth, the bloody moon, the black as sackcloth sun, and any other end time prophecy has already been fulfilled. Daniel 7:13 “I saw in the night visions, and, behold, one like the Son of man came with the clouds of heaven, and came to the Ancient of days, and they brought him near before him. Notice that the context of Daniel 7 is Christ coming with a the clouds of heaven TO the Ancient of Days. Jesus left the earth in cloud (Acts 1:9) on His way to the Father (Jn 16:28). He therefore came to heaven to the the Ancient of Days with the clouds of heaven. Then is when Jesus got the kingdom (Acts 2:34-35). He was crowned, received the Holy Spirit (Jn 15:26), and sent the Holy Spirit to the disciples on the Day of Pentecost. That Day of Pentecost is when Clarke says Matthew 16:28 began to be fulfilled. Clarke says in reference to verse 28, “This verse seems to confirm the above explanation, as our Lord evidently speaks of the establishment of the Christian church after the day of Pentecost, and its final triumph after the destruction of the Jewish polity.” So, we can gather two things from Clarke that damage his position: 1) Christ’s coming in the glory of His Father has to do with Christ’s coming to the Father in Daniel 7, and 2) the coming of Christ in the glory of His Father began on the day of Pentecost. So, according to Clarke, the coming of Christ of which Jesus spoke was NOT the destruction of Jerusalem, but was a process that began at Pentecost with the establishment of the Church. Furthermore, the coming was Christ coming to heaven, not Christ coming at the destruction of Jerusalem. Clarke says the “coming” in Matthew 16:28 is a process, and he thereby admits Matthew 16:28 is not “the day” that the Bible describes as “the day of the Lord”. Clarke’s evidence therefore is that Matthew’s process of the “coming in His kingdom” is not the same thing as the singular “day of the Lord” of which the prophets speak (Isa 13:9, Joel 2:1, etc.). When Jesus comes again, He will come TO the earth, not TO the Father (Lk 19:12. Micah 2:12-13). Paul says that the coming for which Christians wait is the day of our Lord Jesus Christ, and it was a day for which Paul in AD 54, when he wrote 1 Corinthians, was still waiting. The location of Mt Sinai and the location of the Red Sea crossing are closely related. The traditional site is in the middle of the Sinai peninsula and the choice of Red Sea crossing points has mainly been driven by the presumed location of Mt. Sinai. However, the traditional site of Mt. Sinai at St. Catherine’s monastery in the south central part of Sinai was chosen by Queen Helena, mother of Emperor Constantine in AD 315 on the basis of a dream. Most of the places she chose based on her dreams have been proven to be wrong, and that also seems to be the case with the location of Sinai and the travels of Israel that depend upon its location. Where is Mt Sinai and Where Did Israel Cross the Red Sea? We can arrive at a more objective identification the location of the events of the Exodus through the use of a topographical map and a careful consideration of what God said about them in the Bible. Our first objective should be to pin down the location of Sinai, for certainly the route of Israel’s travels will be constrained by the location of their destination. We can gain a clue as to where Sinai is located by recalling the events following Moses flight from Egypt into Midian. Midian is a land east of the Gulf of Aqaba (see ISBE on Midian and map above). During the forty years Moses was in Midian (Ex 2:15), he tended the sheep of his father in law, Jethro (Ex 3:1). While Moses was tending Jethro’s sheep, he had the experience with the bush that would not burn out. When Moses turned aside for a closer look at this strange event, God spoke to him out of the bush and made him a promise. God said, “When thou hast brought forth the people out of Egypt, ye shall serve God upon this mountain” (Ex 3:12). The mountain where Moses saw the burning bush presumably was in the region where Jethro lived, since Moses was pasturing Jethro’s flocks there. The traditional Mt Sinai is over 300 miles by land from Jethro’s home in a region where there is very little water or pasture. Also, to make an Arabic location of Sinai more certain, the Bible specifically says that Horeb (Mt Sinai–Dt 4:10), where Moses had the experience of the burning bush, is in Midian (Ex 3:1). Of course, if Sinai is in Arabia, that location offers many more choices for crossing the Red Sea than a location for Mt. Sinai (Mt. Musa) at St. Catherine’s, for the Red Sea (the Gulf of Aqaba) is the border between Egypt and Arabia for hundreds of miles. Besides specifying that Sinai is in Midian, which is in what was Arabia during the time of Paul (Gal 4:25), the Bible gives many indications that Israel crossed the Red Sea at the Gulf of Aqaba, not Lake Sirbonis or Bitter Lakes or North Suez. These latter sites are too far north, do not provide any reason why Israel should have been trapped there, and do not take into account the elapse of 25 days from leaving Egypt to the Red Sea crossing. Also, the New Testament makes explicit what the Old Testament implies. Paul says that Mt. Sinai is in Arabia (Gal 4:5), and Israel had to cross the Red Sea somewhere at the Gulf of Aqaba in order to stay out of the Promised Land and to get to Arabia (Ex 14:22, 19:1). Scholars have supposed Israel departed from Egypt anywhere from Zoan at the mouth of the Nile near Goshen to all the way to Heliopolis near modern Cairo at the southern border of ancient Egypt (ISBE Definition for ‘RAAMSES; RAMESES’, article by C. R. Conder). Those are widely separated locations. Some proponents of the Heliopolis location cite as evidence the enormous constructions of Pharaoh Rameses II (the largest of all the pharaohs’ constructions except for the Pyramids of Giza) that are found there, for enormous amounts of slave labor were required for their construction, and the slave labor of captive Israel would be a solution to how Rameses could afford to build such structures. 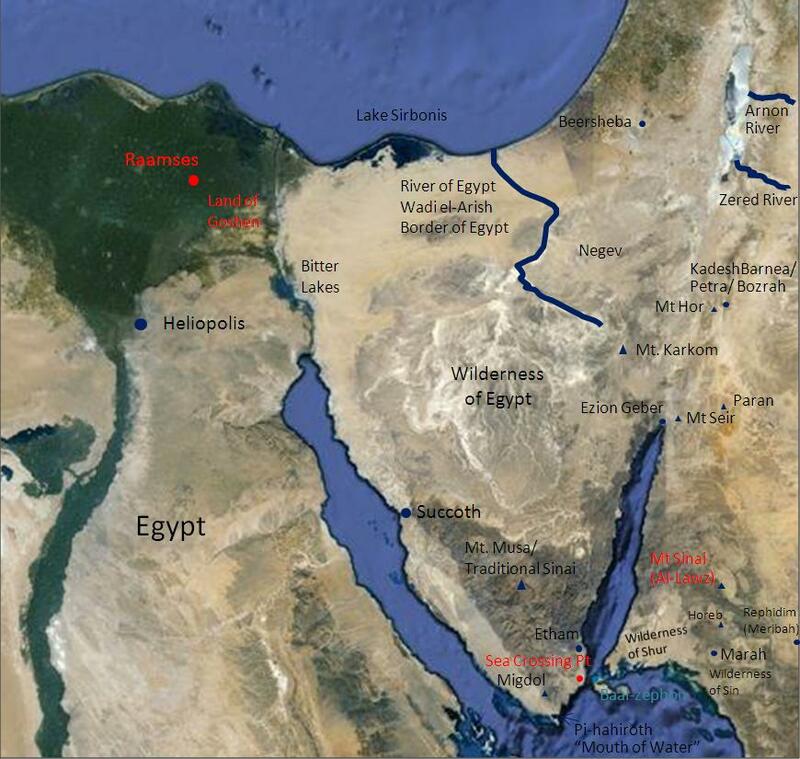 However, Gen 47:11 places Raamses in Goshen (Gen 47:27) on the Nile delta where Israel settled when he moved to Egypt. Since the Bible says Raamses was in the delta, we believe that’s where it was. The Bible gives us information that enables us to calculate that there were 44 days from the time that Israel left Egypt until they came to Sinai. After Israel crossed the Red Sea, they came to the wilderness of Sin fourteen days before they came to Sinai. We can use this elapsed time and the location of their objective to calculate approximate locations for places named along their route of travel. We also assumed that the places named in the Bible were descriptive of unique features of the local geography. Though Moses never promised that Israel would come back once they left, Pharaoh expected them to return (Ex 14:5). Israel successfully “borrowed” (Ex 12:35) valuables from the Egyptians, probably due to the Egyptians’ expectation that Israel would have to return, because a body of travelers the size of the Exodus could not live long term in the wilderness. In Pharaoh’s estimation, a trip of three days out and back plus the celebration should have taken no more than two weeks max. During this time of the Hebrew sacrifice the Egyptians were mourning the death of their firstborn. Probably, the more they mourned, the more angry they became, and when two weeks had passed and Pharaoh received word that Israel had fled and was not returning (Ex 14:5), he was of a mindset to set out after them. It appears from his heedless pursuit of Israel into the depths of the sea that Pharaoh was very angry at Israel and was driven more by an overwhelming desire to take vengeance on Israel for the death of his firstborn ones rather than any rational behavior. That fact that Israel did not come back after a reasonable time may not have been sufficient cause in itself to have initiated Pharaoh’s pursuit. After two weeks Israel could have been anywhere, and Canaan, their most likely destination, was easily accessible in that amount of time. However, Canaan was inhabited by fiercely independent tribes protected by giants and strongly fortified cities (Num 13:33). If Israel had gone to Canaan, they very likely would have been destroyed or driven back to Egypt. God also agreed that Israel was not ready for an immediate assault on Canaan (Ex 13:17), and sent them to the Promised Land “through the way of the wilderness of the Red Sea” (Ex 13:18). Pharaoh also knew that whole armies that ventured into this howling wilderness had perished in the barren waste. If Israel was dumb enough to go too far into the wilderness, Pharaoh knew that the wilderness might do his dirty work for him. It was indeed a lack of provisions in the wilderness that required God to miraculously supply food and water for His people (Ex 17:6). Knowing these things, Pharaoh may not have thought it necessary to pursue Israel since the Canaanites or the wilderness would likely eliminate Israel for him. Since Pharaoh did set out in pursuit of Israel about two weeks after they left, something must have happened to cause him to set out in pursuit. The event that triggered Pharaoh’s pursuit after Israel was a message to Pharaoh via signal fire or carrier pigeon that Israel had fled (Ex 14:5), likely from the Egyptian outpost at Migdal (Watchtower) on the southern tip of Sinai. In whatever way Pharaoh got the message, the Bible says that Pharaoh was told that Israel had fled, and he knew where to take his army to go find them. Israel was in a location that indicated that they had fled from him, for it was more than three days journey away and they were moving away from Egypt. The message from Migdol would lead Pharaoh to believe due to the location of Migdol at the end of the wilderness that Israel was trapped in the extremity of the wilderness (Ex 14:3). The location by Pi-hahiroth satisfies all of the constraints that the text supplies. The name Pi-hahiroth (Mouth of Water) describes a unique mouth shaped bay at the southern tip of Sinai. There is really nothing else like it on the Sinai peninsula. 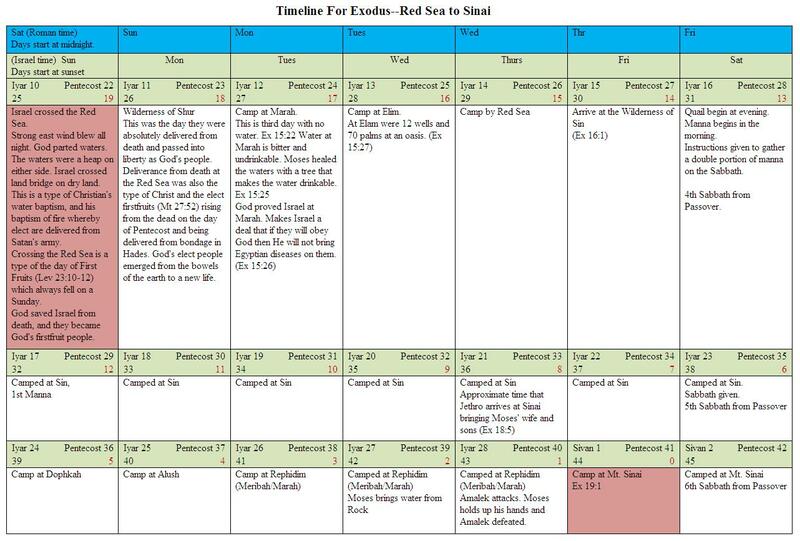 The location by Pi-hahiroth is such that Israel would be able to travel from there to the wilderness of Sin by the 15th day of the second month, as the text requires (Ex 16:1). This camp at the Red Sea northeast of Pi-hahiroth between Migdol and Baal-Zephon placed Israel by a natural underwater land bridge that spans the whole Straits of Tiran at the entrance to the Gulf of Aqaba. Archeologists have found the remains of an Egyptian settlement with a watchtower at the southern tip of Sinai. The Bible repeatedly speaks of a remote location, Migdol, as being at the extremity of Egypt, and the Watchtower at tip of Sinai certainly was (Ezk 29:10 NASB, 30:6 NASB, Jer 44:1, 46:14). This garrison would serve to notify Pharaoh of Israel’s whereabouts and the fact Israel was landlocked at Pi-hahiroth between the mountains at the end of the land and the Red Sea, but how did Israel get to such a remote location at the at the uttermost extent of southern Sinai? Israel left Egypt in a hurry (Ex 12:11), and no doubt was anxious to put as much distance between themselves and Egypt as possible, but Israel had asked for permission to go a three days journey into the wilderness (Ex 3:18), so we would expect Israel acting under God’s guidance to do exactly what they said they would do. Since the Bible says that at some point in their journey they crossed the Red Sea, and they were headed toward the Promised Land, they would have had to travel east out of Egypt. Since they were not using the short Way of the Philistines and were not yet going into the Promised Land (Ex 13:17), they would have had to stay south of the River of Egypt (Wadi el-Arish, see map) that was the southern boundary of God’s land promise to Abraham (Gen 15:18). If God had led Israel across the Sinai wilderness south of the River of Egypt, they could have crossed into Midian across the northern end of the Gulf of Aqaba, but they would not have been entangled in the land nor shut in by the wilderness (Ex 14:3) (See map above and also Steve Rudd’s book on the Exodus at http://www.bible.ca/archeology/bible-archeology-exodus-route-travel-times-distances-days.htm). Wherever the Red Sea crossing point was, it was a location that once Israel crossed the Red Sea, Israel was finally and forever free from the pursuit of Pharaoh (Ex 15:13-14). The only route that fits all the Bible constraints is the route along the west coast of Sinai (“the way of the wilderness of the Red Sea” Ex 13:17) to the land’s end at the Straits of Tiran on the Red Sea. “The way of the wilderness of the Red Sea” that was Israel’s way to Pi-hahiroth would have been along the coastal plain that extends all along the west coast of the Sinai peninsula. Except for fifteen miles of rocky soil, the way is broad and easy, and provided for good travel, even with carts, livestock, children, and old folks, though there was no caravan road along this route, for it did not go anywhere where very many lived. The way was in a howling wilderness (Dt 32:10). Israel left Egypt from Raamses and went to Succoth, but the Bible does not say where Succoth was nor how long it took them to get there, but let’s reason from the record. Israel’s deal all along with Pharaoh was to go a three day journey into the wilderness and hold a sacrifice (Ex 3:18). Since Succoth is their first camp (Ex 12:37), it probably was where they got to after a marathon three day journey. The three day forced march is likely on several grounds. One factor is that since Israel’s deliverance from Egypt serves as type of God rescuing His people from the slavery of this sinful world, God would likely want Israel to provide a type (Col 2:17, Heb 8:5) of what God’s people would be like when He rescues them at the Second Coming. At Sinai God even said that He bore Israel up on eagles’ wings (Ex 19:4), an apparent reference to their extraordinarily swift passage through the wilderness. Walking and not growing weary would serve as a type of God’s deliverance and glorification of the righteous at the end of the world (Isa 40:31). Also, Israel no doubt desired to put as much distance between itself and Egypt as possible, but they had promised it would be a three day journey, and God always keeps His word (Titus 1:2). Israel began its journey just before sunset (Ex 12:16). This is a very peculiar time to begin an arduous journey, if it was going to be the normal sort of journey, and this night journey followed a journey of the night before when they had traveled from all over Goshen to Raamses. The Bible also requires that the journey would not be leisurely but arduous, for God miraculously preserved Israel and kept them from getting tired and kept their feet from swelling (Ps 105:37-39, Neh 9:21). Based on these considerations Succoth probably is a location that was achieved as a result of a arduous journey encompassing three 24-hour days. Israel could accomplish this prodigious feat because God miraculously strengthened them. Further, in a wilderness that was deadly hot by day and pitch black at night, they could still travel continuously, for God gave them shade with a cloud by day and lit the way with a pillar of fire by night (Ex 13:21). Where was this important first camp where Moses sanctified the firstborn and God gave Israel the first law? Obviously, it was in the wilderness, and, as we described, lay at a distance achievable by a 72-hour forced march from Raamses. Since the word “Succoth” means “block” or “stop the approach”, it probably was a geographic choke point. Rudd places it about midway down the eastern shore of the Gulf of Suez at a location where the coastal plain narrows and the rocky soil of the northern beaches gives way to a broad sandy plain that is easy to traverse. This location is 180 miles from Raamses, and it could have been achieved by a people enduring a non-stop 72 hour forced march in which they were supernaturally empowered by God to walk 60 miles a day. When Israel arrived at Succoth, some important events transpired. First, God commanded that Moses sanctify the firstborn of both man and beast (Ex 13:2). The sanctification of the firstborn was the same thing as sanctifying the firstfruits, and the day that Israel arrived at Succoth (the first day of the week) and sanctified their firstborn was the event that serves as the basis for Feast of the Firstfruits, and is a type of the resurrection of the Christ and the 144,000 (Mt 27:52-53), which are the firstfruits of God (I Cor 15:20, Rev 14:4). Sanctification of the firstborn/firstfruits required either redeeming the firstborn by substituting another offering for the first born of the flock (it was to be redeemed with a lamb–Ex 13:13), or in the case of an unclean animal, such as a donkey, that would not be redeemed, its neck was to be broken. In the sanctification of the firstborn at Succoth, therefore, God kept His word that Israel would hold a sacrifice to the Lord. Later we find that Israel’s sanctified firstborn sons were redeemed by giving God the Levites in lieu of the firstborn of Israel and redeeming with money the 273 firstborn not covered by the number of Levites (Num 3:46-47), but that was a redemption of those that had already been sanctified, that is, set apart for God. God also give Moses a first law at Succoth (Ex 13:1-16). The events at this camp were also the prototype of the days of unleavened bread, so Israel probably remained in camp until the 8th day. The time required for Moses to receive the commandment of sanctification of the firstborn, to give this law to the people, to identify the firstborn, and to offer the sacrifices also suggest that Israel spent some time in this camp. 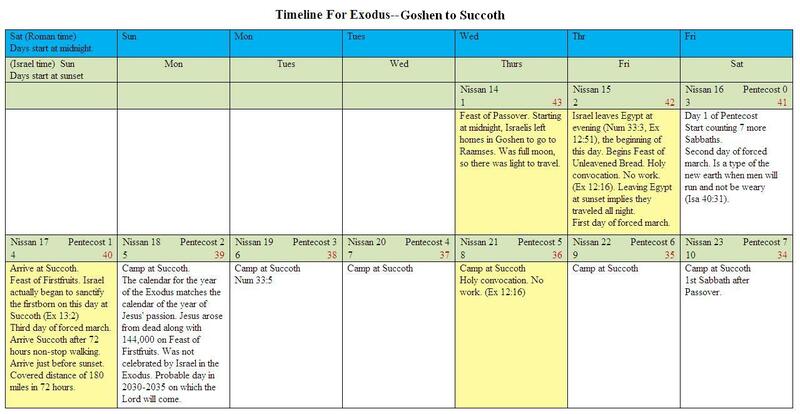 The calendar for the year of the Exodus matches the calendar of the year of Jesus’ resurrection. Based upon the requirement for two Sabbaths on the year of Jesus’ crucifixion, the need for Jesus to be in the grave 3 days and 3 nights, and the fact no gospel records any events on Wednesday if Jesus was crucified on Friday, then we conclude Jesus died on Wednesday afternoon at the time the Passover lambs were being slain (Mt 27:46-50). Jesus was in the tomb night and day Thursday, night and day Friday, and night and day Saturday (3 days and 3 nights). He arose very early on the first day of the week before sunrise. In the same way Israel died to Egypt that Passover night and spent the next three days in the “tomb” of the wilderness from which God supernaturally raised them up to camp at Succoth and consecrate the firstborn. When the days of unleavened bread were complete, God turned Israel further away from Goshen and led them deeper into the howling wilderness (Ex 13:20) in order that He might finish the deliverance of His people. They journeyed for another seven days to arrive at Etham on the edge or “the end” of the wilderness (Ex 13:20). At Pi-hahiroth at the end of the wilderness, God turned Israel up the coast of the Gulf of Aqaba toward Etham. Etham (Hebrew: “shut in”) is a cul-de-sac on the east coast of Sinai where the coastal plain ends at a mountain range that extends to the sea. At this point Israel realized the true extent of their dependence upon God. Hemmed in by the mountains and the sea, Israel realized they were trapped, and God ordered Israel to turn back by the way they had come and pitch camp by the sea. Israel went half a day’s journey (9 miles) back to a location they had just passed and pitched their camp northeast Pi-hahiroth (“Mouth of Water”) and across from the island of Baal-Zephon. Their camp was a deserted location on the shore of the Red Sea between the Egyptian watchtower at Migdol and the Straits of Tiran (Ex 14:2). Here they waited for Pharaoh and his army to catch up and for God to show them what to do. At Pi-hahiroth God prepared Israel for an epoch deliverance from evil men by means of water by which He foreshadowed the deliverance and exaltation of the elect by means of fire at the end of the world. As Israel was baptized in the sea to emerge as a free people in a new world, so God’s elect will be delivered from the armies of the Antichrist on the day when they are baptized by fire (Lk 3:16) and emerge as the free sons of God on His new earth. Counting their camps backward from the wilderness of Sin, we calculate that they crossed the Red Sea on the first day of the week five days before they entered the Wilderness of Sin. They stayed there before Pi-hahiroth seven days while God waited in the pillar of fire for Pharaoh to catch up with them. Israel’s camp by the Red Sea was in a boxed-in place where they would be trapped between Pharaoh’s army and the sea. The boxed-in location of Israel at Pi-hahiroth is typical of the servants of God making their last stand at Bozrah against the armies of the Beast at the end of the world (Bozrah—the sheep pen, Micah 2:12-13, Jer 49:22). When Pharaoh arrived, God protected Israel by interposing the pillar of fire between Israel and the Egyptians (Ex 14:19) while He parted the sea and led Israel safely across. In what must be accounted as one of the most insane actions in the history of the world, the Egyptians that had just experienced firsthand ten devastating plagues, and could see in front of them a supernatural fiery cloud and a supernaturally divided sea, in an attempt to satisfy their bloodlust, rage, and wounded pride (Ex 14:27) decided to defy Almighty God and plunge into the depths of the sea. The rest, as they say, is history. The next day the 600 chariots of Pharaoh (Ex 14:7) were at the bottom of the sea (Ex 15:5) and the dead bodies of the Egyptians washed up on the shores (Ex 14:30). Once the children of Israel got close to Sinai in Midian, they were close to the mountain where Moses had been tending Jethro’s sheep when Moses saw the burning bush. At this point Moses was therefore also close to Jethro’s home. It was when Moses was encamped in the wilderness of Sin in Midian that Jethro, priest of Midian (Ex 18:1), came from his home to meet Moses and to bring to Moses his wife and sons whom he had not seen in several years (Ex 18:5). Perhaps Moses’ reunion with his loved ones foreshadows our own reunion with those that we love and from whom we have been separated by death after we cross our Red Sea in which we are baptized with fire and after which we prepare to enter our own Promised Land. It was the beginning of the third month when Israel encamped before the mountain of God in Midian (Ex 19:1). The beginning of the third month is almost three weeks after they crossed the Red Sea. At that time they had been gone from Egypt for six weeks. Only twelve days after they arrived at Sinai God spoke to Israel from the Mount (Ex 20:22). After God gave the law they spent the next several months encamped before the mount of God, and there they celebrated the first Passover since they left Egypt (Num 9:5). Israel left Sinai almost immediately after the Passover and journeyed to Kadesh Barnea (Petra/Bozrah/Kadesh Barnea). There they camped for the next 38 years until God’s curse on Israel had been fulfilled and the generation that came out of Egypt all died (Num 14:32). An interesting type is provided by Israel’s sojourn at Kadesh Barnea/Bozrah. Where they waited at Kadesh Barnea for God’s deliverance so that they might enter the Promised Land is the same as Bozrah/Petra and is the exact same place where the Lord has announced that He will return first (Jer 49:22, Micah 2:13-14) in the “tents of Judah” (Zech 12:7) to save the remnant of His people that await His return at the end of the world so that they might enter into the eternal land of promise. As we have seen, there is excellent correspondence between the actual geography of Migdol, Pi-hahiroth, Baal-Zephon and Etham, and the Bible’s description of it. Our confidence that we have correctly located Israel’s camp at the Straits of Tiran is greatly strengthened by observing the sea floor topography there. The sea floor across the Straits of Tiran at the entrance to the Gulf is the only place along the Gulf of Aqaba where the sea floor terrain would support the crossing of several million people with herds, children and carts without a supernatural modification of the sea floor, for the Gulf is very deep everywhere else, often over a mile deep along much of its length. In marked contrast the sea at Pi-hahiroth is only about 40 feet deep in places, and there is a strip of land a half mile wide that runs across the entire width of the Strait. On this land bridge there is only one 2400 foot wide channel where the water currently is over 600 feet deep. It appears that the growth of a coral reef in the middle of the straits of Tiran has caused sea-floor erosion of this channel due to tidal currents flowing around the reef. In support of the view that this channel has been eroded deeper in the 3500 years since Moses crossed here, we notice that the entrance to the Gulf of Aqaba in Moses’ day was very obscure. Though the Gulf of Suez was well known, the entrance to the Gulf of Aqaba was so obscure that it did not appear on maps until the 1800s. Because in Moses’ day the entrance to the Gulf was not well known we might then conjecture that storm tides and eddies around the coral reefs have eroded the channel to a depth greater than what existed at the Exodus. In any event God could easily have silted up the channel in preparation for Israel’s crossing, if He so desired. Even in the one spot that is now deep, the drop to 600 feet is spread over about a quarter of a mile, so there is only about a 27 degree slope to the depth. From our study we have seen in the Bible that the mountain of God is in Midian and Midian is in Arabia east of the Red Sea. The fact that Moses did not cross the Red Sea for over four weeks after they left Egypt suggests that Israel traveled a significant distance to arrive at the Red Sea crossing point. The geography at Pi-hahiroth at the Straits of Tiran and the sea floor in the Gulf of Aqaba there both support the Bible’s description of the Red Sea crossing. Israel’s journey from Goshen to Sinai via this route was of sufficient length as to require much of the 44 days the Bible says that it took Israel to travel from Goshen to Sinai. After they crossed the Red Sea they crossed into Midian in Arabia, and as they came to Sinai they came close to Jethro’s home in Midian (Ex 18:2-3) at which time Jethro returned Moses’ wife and sons. The description of the events, places, timing, and geography of the Exodus exactly fit a scenario that locates Sinai in Midian at Horeb and the Red Sea crossing at the Straits of Tiran. I just read in the Emet Report that King Abdullah of Saudi Arabia was so exceedingly angry with Obama following his last conversation with Obama that he may have had a heart attack. King Abdullah is a strong personal friend of Mubarak, and he did not intend to sit idly by while Obama sold Mubarak down the creek calling for him to step down. King Abdullah informed Obama that without waiting for events in Egypt to play out or for America’s response, he had ordered the process set in motion for raising the level of Saudi Arabia’s diplomatic and military ties with Iran. Invitations had gone out from Saudi Arabia for Iranian delegations to visit the main Saudi cities. There are a couple of Bible prophecies that bear on these events. One says, “All thy [Israel’s] lovers have forgotten thee; they seek thee not” (Jeremiah 30:14). In the past two weeks, Israel has lost its allies of Egypt, Jordan and Saudi Arabia, and the current US regime has demonstrated that it is no friend of Israel and has no commitment to Israel’s security. Psalms 83:2 For behold, Your enemies make an uproar, And those who hate You have exalted themselves. 3 They make shrewd plans against Your people, And conspire together against Your treasured ones. 8 Assyria also has joined with them; They have become a help to the children of Lot. Selah. The Bible uses the ancient names for these places, so it is instructive to lay out the ancient places with their modern counterparts. Tents of Edom is the people that live around the southern part of the Dead Sea. These would be Bedoins and the Southern Jordanians. Hagarites are the Arabs in the eastern part of Jordan and Southern Iraq. These people are the descendants of Hagar, Abraham’s concubine. Gebal is Hezbollah and Northern Lebanese. Ammon is the Palestinians and Northern Jordanians. Amalek is the Arabs of Saudi Arabia in western Saudi Arabia near the Gulf of Aqaba. Philistia is Hamas of the Gaza Strip. Tyre is Hezbollah and the Southern Lebanese. Assyria was a large empire that included what is today Iran, Iraq and Syria. Egypt will not participate in the Iranian alliance because the Egyptians will be too busy fighting among themselves. Isaiah 19:2 says, “Isaiah 19:2 And I will set the Egyptians against the Egyptians: and they shall fight every one against his brother, and every one against his neighbour; city against city, and kingdom against kingdom. Those that are in the list in Psalms 83 are identical to those that are enemies of Israel today. These all conspire together and say, “Come, and let us cut them off from being a nation; that the name of Israel may be no more in remembrance.” They will almost succeed, but God will intervene and destroy their armies. Israel will then inherit the land from northern Lebanon to the Red Sea and from the Mediterranean to the Euphrates. It appears to me that it is no longer possible for Israel to attack Iran without going on a suicide mission. The Saudis and Jordan are now joining the Iranian confederacy, and will therefore not offer Israel help in attacking Iran. The US will not grant Israel the IFF codes that would get them through Iraqi airspace or across the Persian Gulf. They don’t have enough planes in Georgia and Afghanistan to stage a successful attack against Iran. These planes are now landlocked and will not be available to defend Israel when they are attacked. I do not see any way they could carry out a successful attack and not basically blow out their entire air force. It now is a just of matter of time until Iran invades Israel and almost destroys it. The Sibylline Oracles predict the time of Antichrist will arrive when “the limit of the time of the Phenix” comes around (Sib Orc 8:184, http://www.sacred-texts.com/cla/sib/sib10.htm). The complete number (“limit”) of the firebird is 7. The first century Roman historian Tacitus reported the 4th Phoenix/Firebird appeared in the days of Tiberius in AD 34 (Annal., vi, 28). The story of the firebird is this: The firebirds live 500 years and then they return to Egypt, hatch another bird and die. The young bird burns his father to ashes, and then rises from the ashes and flies away, not to be seen again for 500 years. I know the firebird sounds crazy, and Tacitus, being the careful historian that he was, felt the same way. In Tacitus’ account of the phoenix he is apologetic for even mentioning it, but he says that he does so because he heard it from so many ancient sources including intellectuals in both Egypt and Greece, and he included it for completeness. Apparently, it caused quite a stir in Egypt because it was so extremely unusual and was witnessed by so many people. The return of the firebird was very obvious because the firebird came “with a multitude of companion birds marveling at the novelty of the appearance” (http://classics.mit.edu/Tacitus/annals.6.vi.html). Tacitus’ report of the 4th phoenix gives a firm date with which to do computations for the origin of the firebird. Tracing the firebirds backwards (assuming the 3rd one ended and the 4th one began in AD 34), then the first one began in 1466, coincidentally with the time that Israel began its trek to the Promised Land. A sheer speculation could surmise that the first firebird began by rising from the ashes on Mt Sinai (Dt 4:11). Based on the Tacitus observation of the 4th firebird, we can also compute the end of the firebird. If the 4th firebird started in AD 34, then the 5th firebird started in 534, the 6th in 1034, and the 7th in 1534. The limit of the 7th and last firebird will be at the end of its 500th year in 2034. When the 7th firebird reaches its limit, the Sibyls say the Antichrist/Beast will destroy Rome. That is about 3 years before the end of the world. There is a compelling correspondance with an end of the world computed based on an AD 33 date for Jesus’ resurrection and the death of the last firebird. Jesus’ resurrection was 4, one-thousand-year days from creation. Like the physical creation took 6, 24-hour days to create, Barnabas says the world will only last 6 of these one-thousand-year days until the Lord brings all things to an end (Barnabas 15:4, http://earlychristianwritings.com/text/barnabas-lightfoot.html). The end of the 6th day is around 2033, depending on exactly the year in which Jesus was crucified. Before the Antichrist burns Rome (Rev 17-18) at the return of the last firebird, there are to be a series of four plagues that preceed it (Rev 8:1-13). The second of these plagues is where a “great mountain burning with fire” is cast into the sea. Sure enough, an asteroid, Apophis, appears to be on a collision course with the earth in 2029 (http://www.guardian.co.uk/science/2005/dec/07/spaceexploration.research). Looks like it’s all coming together for an end of the 6th day. After 10 years of work my commentary on Revelation, All Power to the Lamb, Volume I, arrived from the publisher. It is the only commentary that I know of in the two hundred years of the Restoration that takes a literalist, futurist approach to understanding Revelation. My commentary seeks to avoid telling God what He should have said and strives to understand what God actually meant. My commentary takes the position that God wrote Revelation in such a way that with sufficient effort and intellectual honesty, readers can understand it. Certainly there are symbols in Revelation, but when God does use symbols, He provides inspired interpretations of the symbols. This commentary seeks to avoid the mistakes of the views that use the symbolical approach to Revelation (preterists, continuous historical, spiritualist, and idealist). These approaches suffer from two basic flaws: assuming the text is symbolic when it is not and making up meaning regarding the text based on stream of consciousness word association, much as one would do looking at Rorschach inkblots. Of all the approaches to understanding Revelation, this commentary is most closely aligned with the dispensationalist view in that it views Revelation from a literalist, futurist perspective. It is different from the typical dispensationalist schema in that it views the seven seals as the powers of the Lamb, understands the exercise of the powers of the seven seals to be simultaneous processes, and casts chapters 8-22 as three parallel prophecies of the Lamb’s power over the course of the histories of Israel, the nations, and the saints. This commentary also makes use of many of the non-canonical works that provide insight into the spirit world and detail regarding the course and end of the present age. See for more information click here: http://bit.ly/gFPCvy . Don Preston argues that the “last days” in Isaiah 2:2 defines the context of all of Isaiah 2-4 to be the “last days”, which Preston then further defines to be the Destruction of Jerusalem. In the list below Preston takes scriptures from Isaiah 2-4 and finds what he takes to be parallels in Revelation. Then, Voila!, he concludes Revelation is merely a highly symbolic book describing the AD 70 destruction of Jerusalem. There are a couple of problems with Preson’s approach. First, the context of Isaiah 2-4 is not continuous, and the list of scriptures from there therefore does not speak of a single prophetic event but refers to various times and events. Second, the parallels he draws from Revelation are often not parallels at all, as we show in the comments. Since the prophecies in Isa 2-4 do not pertain to a single event, the comparison with Revelation is relatively meaningless. The context shifts from the “last days” referring to the last 2000 years of the earth (Isa 2:1-4) to the sordid moral condition of Isaiah’s day (Isa 2:5-9) to the Second Coming (Isa 2:10-22) to the day of Jacob’s trouble (Isa 3:1- 4:6). The argument appears to be, John lived in the last days, therefore his Revelation is for the last days. I don’t have a problem with this, except that the “last days” only defines a time subsequent to one half of the total duration of this age. “The last days” does not require fulfillment of all things in John’s day. In fact, most of the events Isaiah mentions that are in the 3000 years of the last days are clustered toward the end of that time. The last days are the last 3, 1000 year days. 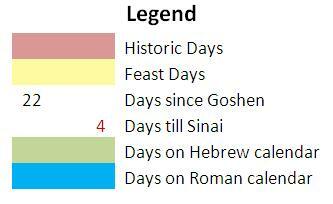 Starting from Pentecost (the 5th day) and including the millennium (the 7th), there were 3 out of 7 days left. The “last days” cannot be limited to the time just before the coming of Christ, because the Lord’s house does not descend until after Jesus returns at the close of the 6th day. The coming of Christ is the end of the 6th day and the beginning of the 7th (“very early in the morning”, cp Mk 16:2). The Lord’s house descends on the 7th day, but the 7th day is one of the last days. What happens in the last days? Isa 4:4 says not one word regarding the shedding of the blood of prophets. No match here. Rev 16:6 speaks of the third bowl of wrath. This plague is the same as the third trumpet plague in Rev 8:10-11 that involves the Amazon basin polluted by fragments of a poisonous asteroid. Babylon is not mentioned until the seventh plague. There is no logical connection between Babylon that is mentioned in the 7th plague and the blood of the prophets in the third plague of Rev 16:6. The connection between the plagues only exists in the DOJ scenario, but that is the issue to be proven. You can’t assume a conclusion, and then use your assumption to prove your point! Isa 2:19ff and Rev 6:9-17 are actually parallel. However, Isa 4:2ff is not. God is the Avenger of Blood (Rom 12:19), and on the day of the Lord, He will do just that. Isa 4:2 has a different context. There are several things about Isa 4:1-6 that do not fit the context of the DOJ, the coming of Christ, or the new earth. 1. There are many more women than men, and they are so desperate for children that they are willing to support themselves and their children if the men will only take away their reproach. This event is probably the one that was foreshadowed by Pharaoh’s murder of the males during the days of Moses. At the antitype event described in v 1, like the time of the Exodus, men will be scarce because of their deaths related to protecting the country from the Assyrian invasion. Like it was when Israel left Egypt that Israeli men had multiple wives, so it is here in Isaiah 4 that multiple women will attach themselves to one man. 2. It is time of escape for Israel. That did not happen at the DOJ. Israel was conquered, but Isa 2:2 shows an Israel that escaped the assault made upon them. This verse also does not talk of the Second Coming or the New Earth, because it talks about “survivors”. At the Second Coming, everyone will die. 4. The purging of blood from Jerusalem by judgment and burning happens when there are people left in Zion and Jerusalem. That did not happen at the DOJ, and nobody will remain after the Second Coming. The earth will return to primeval silence for 7 days after Jesus comes again. 5. No literal sense can be made of verse 5 with respect to the DOJ. The description of a cloud and pillar of fire also does not describe the new earth, for then floating city of New Jerusalem will be above the earthly Jerusalem. The pillar of cloud and fire are what happened to israel in the wilderness. Isaiah’s description here shows that at some point in the future before New Jerusalem descends, God’s visible presence returns, just like it did before the Exodus when Israel gathered at Raamses to come out of Egypt. 6. No cloud protected or lightened Israel at the DOJ. Also, New Jerusalem will be the light of earthly Jerusalem on the new earth, not a pillar of fire. Verse 6 describes an event that is yet to be when God sets His visible presence over Israel. It will remain there until He comes again. The pillar stood between Israel and the Egyptians before Israel crossed the Red Sea. It will stand between Israel and the nations before God’s people cross into the new heavens and new earth. This time instead of crossing a sea of water, God’s people will cross a sea of fire when Jesus returns to redeem the earth and rescue His people. Isa 3:1-26 also contains things that do not fit the DOJ, the Second Coming, or the new earth. The term “the day of the Lord” does not appear in this chapter. Isaiah uses the term “in that day”, and you have to determine from the context what day it is. The day of which Isaiah speaks is a day when Judah has fallen and Jerusalem is ruined, but the Israeli people remain in the land and in control of their ruins. On the day of Jacob’s trouble, the Assyrian invaders actually overrun northern Judah and get as far as the suburbs of Jerusalem (Isa 10:24-34) before they are turned back. Only on the day of Jacob’s trouble do you have a situation where Judah falls and Jerusalem is ruined, but somehow Israel survives and remains in control in the land. This is not true of any other historical or prophetic event regarding Jerusalem. 1. Children will rule in Jerusalem (v4) 2. People will live in Jerualem among ruins (v6) 3. Women rule in Jerusalem, even as Isaiah 4:1 describes a population in Jerusalem that is disproportionately women. (v12) 4. Clothes are destroyed, but people survive (v17, 6, 7, 24) 5. Baldness and scabs on the heads of young women is a symptom of radiation poisoning, not the DOJ or the end of the world. (v24, 17) 6. The men are destroyed in the war (v25). At the DOJ everybody died, fled, or was taken captive. At the end of the world, everyone dies. Only on the day of Jacob’s trouble do you have an event where a disproportionate number of women survive. Again, nowhere in Isaiah 4 does Isaiah use the term, “The day of the Lord”. He uses the term “in that day”, and the day to which he refers must be determined from the context. The context of “that day” is a ruined Jerusalem where women outnumber men 7 to 1. It is a day when God’s visible presence has returned to Israel after many days (Hosea 3:4-5). It is a day when Israel at last seeks the Lord and their Messiah, David their king (Hosea 3:5, Jer 30:9). Like Jesus was in the cloud that protected Israel in the wilderness (I Cor 10:4), so Christ will return in the cloud in Israel, and Israel will finally recognize Jesus’ claims. I agree that the mountain of the Lord’s house in Isa 2 is New Jerusalem in Rev 21, but the preterists do not believe either Isa 2 or Rev 21 is telling the truth. They do not believe it is literally a house, but is a symbol for the church. I don’t know how this helps their case that Revelation is all about the destruction of Jerusalem. I do not agree that either of these passages has any reference to the Destruction of Jerusalem. This is another of Preston’s hodge podge of scriptures that he erroneously applies to the DOJ. Acts 2:16-17 says the day of Pentecost was in the last days and thus defines Pentecost and after as being in the last days. Joel says The law of the Lord went forth from Zion and from Jerusalem went the word of the Lord, and that happened with the preaching of the gospel. Preston reasons that since Isa 2:2 is in the last days, the fulfillment of Isa 2:2 follows Pentecost and refers to the DOJ. I agree that the Spirit was poured out on all flesh in the last days (Act 2:18), and the word of the Lord went forth from Jerusalem as fulfillment of Micah 4:2. These things happened in the last days, and the day of the Lord follows Pentecost, but Preston goes on to conclude that not only did the last days arrive in AD 30, but the day of Lord also arrived in AD 70. Preston’s view is excluded by a consideration of Joel’s requirement that the moon is turned to blood and sun to darkness in the last days but before the great and notable day of the Lord will come. Those things did not happen at or before the DOJ. So, Peter says we are in the last days (Acts 2:16-17), but the harbingers of the day of the Lord have not yet arrived. Preston says the descent of the tabernacle from heaven follows the day of the Lord and cites Rev 21:2ff. John does indeed call New Jerusalem the “tabernacle of God” (Rev 21:3), and its descent follows the day of the Lord, but it is no help to the preterist position that tries to make the DOJ is the day of the Lord. The day of the Lord comes after the moon is turned to blood appearance and the sun to darkness appearance (Joel 2:28), and the day of the Lord is the day Jesus returns (I Th 4:14-5:3, II Pet 3:10). The tabernacle of God comes down from heaven after Jesus returns, cleanses the earth with fire, and resurrects the dead (Rev 20:9-21:3). If Preston is correct, the DOJ would have to happen after all these things. There are three equal periods of earth history: 2000 years of the dispensation of the Patriarchs, 2000 yrs of the dispensation of the Law, and 2000 years of the dispensation of Christianity. The last days are the 2000 years of the dispensation of Christianity. The mountain of the Lord’s house will be established above (YNG version) the top of the mountains. The mountain of the Lord’s house and His tabernacle is New Jerusalem. New Jerusalem literally will descend in the last days at the end of 6000 earth years. The last days probably began at the resurrection of Christ. That was nearly 700 years after Isaiah wrote. However, Isaiah said nothing about the last days being “far off”. Preston injects that idea into the narrative. He attempts thereby to cast the idea of the relative time statements like “must shortly come to pass” in terms of a human lifetime. We have already shown that is not valid through a consideration of the mountain of the Lord’s house that must come to rest above the hills in the last days. The mountain of the Lord’s house does not descend until after Jesus’ Second Coming and the Judgment (Mt 25:31, Rev 20:11, 21:1-27) in the beginning of the 7th day. The present age lasts 6000 years or six days (Barnabas 15:4). Since the end of the sixth day does not come until 6000 years of earth history, and the descent of God’s house does not come until after the sixth day, then the “shortly” terms in Revelation must be evaluated in this light. From a consideration of the fact that we are in the “last days”, from God’s perspective, the time is less than half of the whole 6000 year age of the earth, and from that perspective 2000 years would be “shortly”. Is There a Parallel Between Zechariah 14 and Revelation? 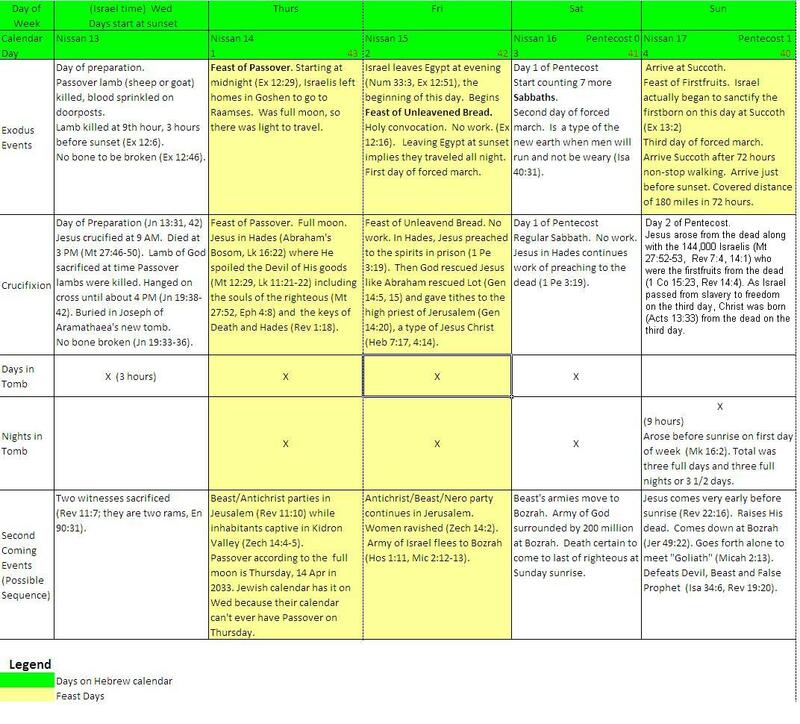 Don Preston created the first two columns of this table in which he presumes Zech 14 is the AD 70 destruction of Jerusalem. He then picks verses from all over Revelation, no matter the context, in an attempt to show that all of Revelation matches Zech 14. He thinks this shows Revelation is just an extremely figurative account of the AD 70 destruction of Jerusalem. Destruction of Jerusalem (1 f) Fall of city where the Lord was crucified (11:8) Zech 14 is not the AD 70 destruction of Jerusalem, but the capture of Jerusalem at the end of the world. Zech 14 and Rev 11 are parallel prophecies, but they speak of the capture of Jerusalem at the end of the world when God splits the Mount of Olives in half, and God did not do that in AD 70. Escape possible (5) Come out of her lest partake of plagues (18:4) Escape was not possible at the DOJ. Fugitives were crucified. Those remaining at its fall were led captive, the city was burned and then leveled. The captives did not escape after an earthquake at the DOJ. The Hebrew in Zech 14:6 is very difficult, and the translators have redered it in widely different ways. Zech 14 describes the coming of Jehovah and the end of the age. The Sibyls say that when the age ends that the earth will be shrouded in dust, and the sky will be left without a single star (Book III:710). IMO, Zechariah 14 is the Sibyls’ twilight at the end of the world (Book III:993-1001), and the KJV’s idea that the light on that day is diffuse and dim is probably right. The majority of the translations view this text as happening in a time of semi-darkness and not eternal day as Rev 21:25 describes. Besides if this event is supposed to be the DOJ, how in the world do you get eternal day out of the destruction of Jerusalem? Lord shall be king (9) God on the throne (22:3) These two passages do refer to the same time, but both of them refer to the condition that follows the day of the Lord when Jehovah shall have taken unto Him His great power and reigns over all the earth (Zech 14:9). Jehovah did not do that at the DOJ. No more curse (11) No more curse (22:3-4) To apply these passages to the destruction of Jerusalem is willful ignorance. The curses include death, pain in childbirth, weeds, nettles, thorns, mute animals, and vicious wild beasts. All of these curses are still in effect. These verses cannot possibly refer to the DOJ. Zech 14 makes no reference whatever to Babylon. There is no relationship between Zech 14 and Rev 18 or any other Babylon verse. There is no chain of logic to link between Zech 14 and Babylon, so there can be no “therefore”. Nations come to Jerusalem (16f) Nations come to Jerusalem (21:26f) Rev 21 shows New Jerusalem coming down from heaven. Did this happen at the DOJ? Rev 21 describes a city 1500 miles on a side in which only the kings of the earth may enter. Was this true at the DOJ? Both Zech 14:16 and Rev 21:26ff describe a situation that has not ever happened. This cannot possibly refer to the DOJ. The social aspect of Obama’s wrecking crew is what worries me the most. By the time Obama is done, homosexuals will be the accepted ones and Christians will be persecuted. To oppose them in any way will be hate speech whereas their death threats and actual violence will be excused. I am also thinking Obama is likely to stand quietly by while Iran and the Arabs attack Israel. Israel will be severely injured, but her enemies will be destroyed. I wonder what will happen in this country when Obama stands idly by and lets Israel take it on the chin from the bullies that surround her. Israel will be abandoned by men, but not by God. Here is the scenario. Psalms 83:2 For, lo, thine enemies make a tumult: and they that hate thee have lifted up the head. 13 ¶O my God, make them like the whirling dust, Like chaff before the wind. 16 Fill their faces with dishonor, That they may seek Your name, O LORD. Isa 17:11 13 The nations rumble on like the rumbling of many waters, But He will rebuke them and they will flee far away, And be chased like chaff in the mountains before the wind, Or like whirling dust before a gale. 14 At evening time, behold, there is terror! Before morning they are no more. Such will be the portion of those who plunder us And the lot of those who pillage us. A very intersting point to me is the prophecy that when Israel is surrounded by enemies and without a helper and these enemies attack to take away God’s people (Ps 83:4), God will fight for them (Ps 83:15, Isa 17:11-13). The Psalmist asks (obviously with God’s permission to put the request into the psalm) for God to pursue the enemies with His storm and His tempest. It sounds to me like that though Israel will be forsaken by men that God will intervene with some visible stormy manifestation, even as He did in the days of Joshua (Josh 10:11). When this thing with the Day of Jacob’s trouble is over, God will have unmistakeably shown Himself to be the Savior of Israel. Israel will be severely injured (Isa 17:6-9), but her enemies will be destroyed (Jer 30:8), and she will live in peace until the time of the end (Jer 30:10, Rev 11:3-7, Ez 38:8, 11-12, 14). I know a lot of people believe that Ezek 38 will come into play shortly after the time of Jacob’s trouble. I do not believe that is the case, however. I believe Ezek 38 to be the Battle of Armageddon at the end of the world. To determine the context of Ezek 38, we need to look at the complete account of the Gog/Magog invasion, and that account covers all of Ezek 38-39. There are several things that make this lengthy passage highly unlikely to be describing a scene before the end of the world. Consider Ezekiel’s description of the invasion as being one of men mounted on horses (Ez 38:15). That does not correspond to a modern invasion by Russia with tanks and planes. Ezekiel also promises that Israel will know that the Lord is their God from that day forward (Ezek 39:22). Whenever the Gog/Magog event takes place, Israel will uniformly thereafter serve God, but such a thing would not happen before the establishment of universal righteousness upon the earth, and that does not happen until the end of the world (Isa 11:1-9, Hab 2:14). Another verse that shows the end times context is Ezek 39:25. God will restore the fortunes of Jacob and have mercy on the whole house of Israel (Ezek 39:25). At this point in our modern time, only some from Judah and Manasseh have returned to Israel, but the text promises that when God destroys Gog, He will gather Israel from all the nations. He will not leave ANY of them in these lands any more (Ez 39:28). There are currently Jews living all over the world, and probably will be until the end of the age. Having remnants of Israel scattered all over the world does not fit Ezekiel’s prophecy. The Bible describes the reunion of the 12 tribes in Hosea 1:11. Hosea recounts a reunion of Judah and the children of Israel at a time when they appoint a common leader. After this historic reunion of the 12 tribes and the selection of a common leader, instead of uniting to build up Israel and living happily ever after in the land, they incredibly immediately leave the land! The most plausible explanation for this incredible action is that the Antichrist is invading and these reunited tribes retreat to Bozrah where scripture foresees the beginning of their eternal victory at Jesus’ return (Micah 2:12-13, Zech 12:7, Isa 34:6, 63:1, Jer 49:22). I want to notice several characteristics of Ez 38-39 and compare them to passages in Revelation to show that the context of Ez 38 is the end of the world. The comparable passages in Revelation are clearly linked to the very end of the world, because Jesus comes, defeats His enemies and casts them into Gehenna hell (the lake of fire–Rev 19:20, 20:10). Since Ez 38 and the Rev passages are parallel, then Ez 38 is also the end of the world. To understand my arguments regarding the Battle of Armageddon passages in Rev (Rev 16:13-16, Rev 19:17-21 and 20:8-9), I need to explain my analysis of Rev 8-22. My view of Rev 8-22 is that this large section of Revelation deals with Christ’s power over the course of history that He obtained when He opened the 7th seal (Rev 8:1). These chapters 8-22 are a prophetic description of God’s plan between Pentecost and the Second Coming for the three major groups of people on earth: Israel, the nations/Gentiles, and Christians. The prophetic plan for the course of the history of Israel is in Rev 8-14. The prophetic plan for the history of the nations is in Rev 15-19, and the prophetic plan for Christians is in Rev 20-22. Each of these major sections has a coming of Christ to the Battle of Armageddon. Hence you have several accounts of the Battle of Armageddon (Rev 16:13-16, Rev 19:17-21 and 20:8-9) and the events in preparation for it (e.g. Rev 9:13-19, 11:7-13). Now lets look at the Gog/Magog invasion in Ezek 38 and compare the characteristics of the Ezekiel invasion with the Battle of Armageddon that happens at the coming of the Lord. We notice that Ezekiel’s invasion happens in the last days (Ez 38:16). It comes from the north (Ez 38:15). There will be so many of the invaders they will be like a cloud covering the earth (Ez 38:9). During their invasion there will a severe world-wide earthquake (Ez 38:19-20). God comes and fights for His people (Ez 38:18-19, 21-22). The invaders will fall and God will call the animals and birds to eat them (Ez 39:17-18). God will set His glory among the nations and ALL the nations will see the judgment that God has executed (Ez 39:21). God’s servants will thereafter always know that the Lord is God (Ez 39:22). These descriptions of Gog’s invasion include the same details as found in Revelation regarding the invasion of the Antichrist/Beast/Man-of-Sin. There are parallel accounts of this last invasion in Rev 16:13-16, Rev 19:17-21 and 20:8-9. The Gog/Magog invasion happens right at the end of the world (the Beast captures Jersusalem in Rev 11:9-12, but it is just before and at the Second Coming and the resurrection of the dead). In these accounts we find that the invaders first gather at Armageddon (Rev 16:16) in the north of Israel and ride from there south to Jerusalem (Rev 11:7-8, Joel 2:9, Zech 14:2). The heavens and earth will quake before them (Rev 16:18, Joel 2:10). Christ and His armies return and fight for their people (Rev 19:13-14). Jesus and His armies kill the hordes of the Devil and the birds eat the slain (Rev 19:21). After God’s victory at the last battle (Rev 20:8-9), He brings New Jerusalem down from heaven and sets His glory in the midst of the nations (Rev 21:10-11). Thereafter the servants of God will KNOW that the Lord is God, because they can see His house and see His face (Rev 22:4). The descriptions of the last battle as described in Revelation match the characteristics of Ez 38-39, but the events in Revelation are obviously the end of the world (Rev 19:20-21, 20:8-10) because of the resurrection and final judgment. The day of Jacob’s trouble is a highly significant event in God’s plan. The plight of Israel being surrounded by the nations and having no one to help but God is a type of the end of the world when the remnant of the forces of righteousness will be shut up at Bozrah (Micah 2:12) where they will be surrounded by the forces of the Devil. God will fight for Israel on the day of Jacob’s trouble, and His deliverance will be spectacular. It will be clear to all that it was God that delivered Israel from their trouble. No man was able to help them, but God will gloriously deliver them. God’s deliverance on the day of Jacob’s trouble will be a type of the end of the world as when Jesus comes to deliver His people from the army of the Devil (Rev 19:19-20, 20:8-10, Jer 48:40, 49:22). After the day of Jacob’s trouble, Israel lives in peace and prosperity until the very end of the world (Ezek 38:11-12). That is a type of the peace and prosperity that God will bring to His people forever when He sets up the new heavens and the new earth (Mi 4:4-5, Isa 65:17-19, II Pet 3:13). The Bible has quite a bit to say about the day of Jacob’s trouble, but I don’t know what happens to the USA under Obama. If you believe George Washington’s prophecy (http://www.civil-liberties.com/pages/prophesy.html), there will be a remnant of us left when Jesus comes. If you believe the USA is the 7th head of the beast (Rev 13:1), then we recognize that the 7 headed nation beast is under the control of the Devil (Rev 13:2). That would mean the USA goes over to the dark side. That’s the way it looks to me at the moment, which is bad news for Christians. The power to tax is the power to destroy.